It's like Christmas! - Let's keep that in the sanctity of your brain, shall we? 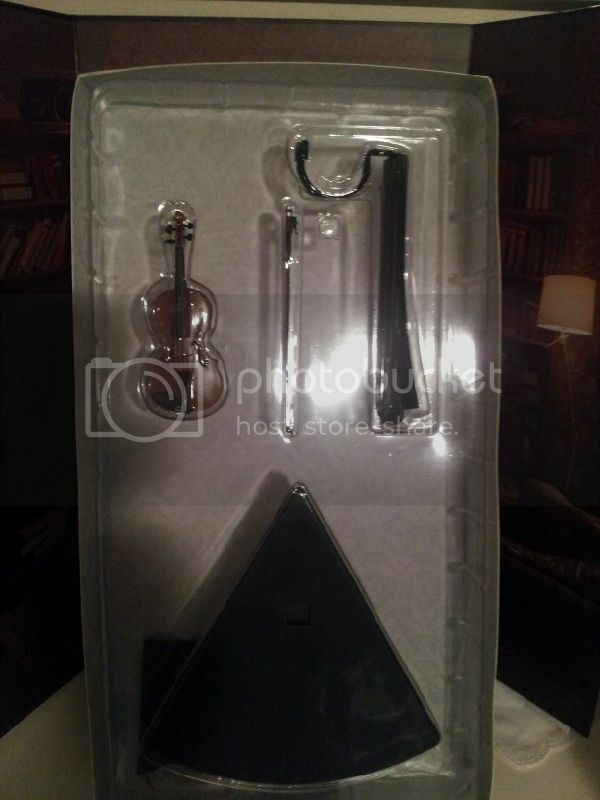 This is what I bought myself for Christmas - last Christmas, that is. Pre-ordered in October 2013 and they finally, FINALLY arrived today. 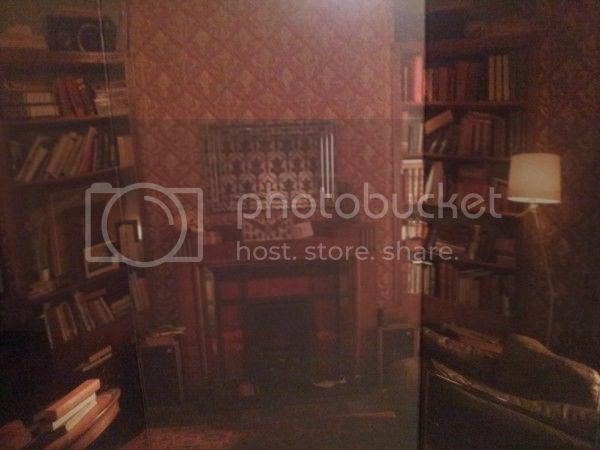 So this is the slipcover for the box that they came in.... numbered set 011 out of 200 only. 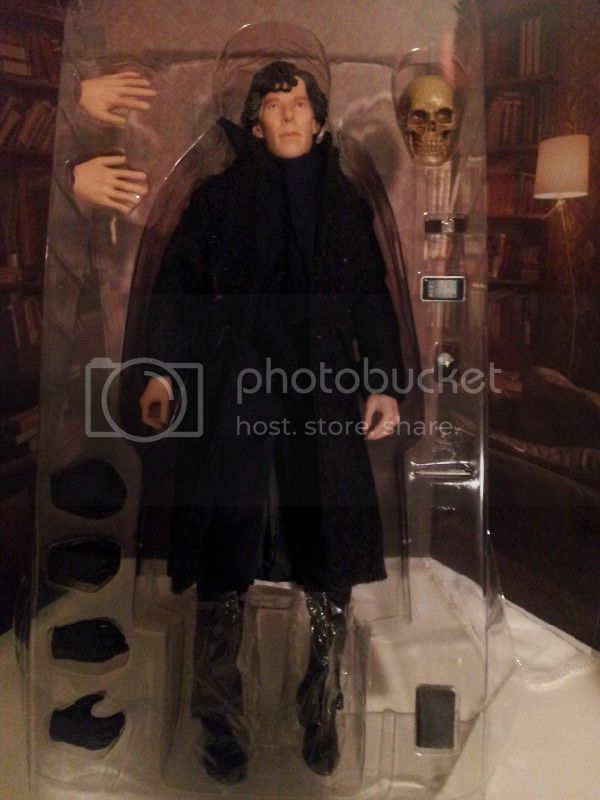 They come with posable hands, and small items eg phone, notebook, pen, watch and magnifier for Sherlock, plus gloved hands, and John gets a cup of tea! 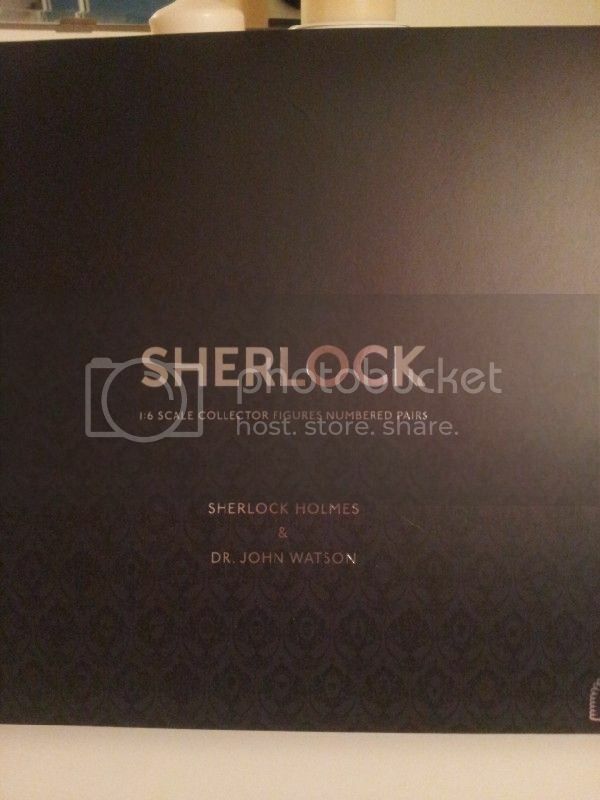 You can't actually see the detail in these photos - Sherlock is wearing a black wool coat, with a satin lining, and when you open it he has a navy wool scarf on over a black suit. It's incredibly well-done. 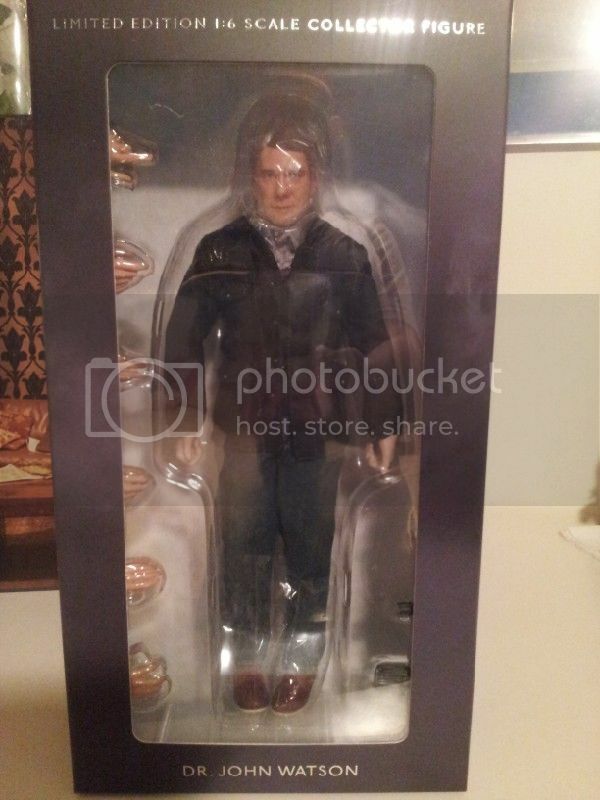 I haven't taken John out of the box yet - didn't want to take Sherlock out at all but it was difficult to photograph him otherwise. Oooooh! I bet you had fun photographing this! I must admit, the disembodied hands were a bit unnerving. I thought they might be props to put in a fridge. Ahem. 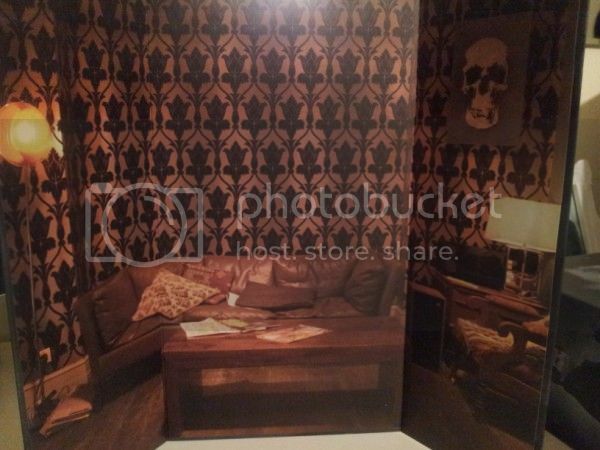 Embarrassing, I know, but, do you know what, it was only when I saw the picture of the background panels that I realised where your LJ theme background image must come from. I am slow, I know! Very glad they turned out to be worth the wait. Thank you for sharing them with us! 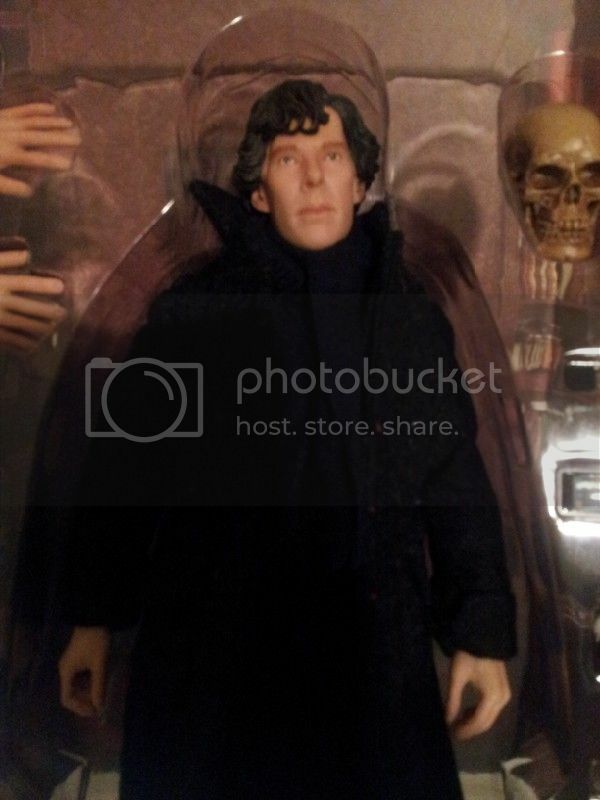 They're fairly large, about 12 inches tall; Sherlock is a bit taller than John which is correct - I haven't taken John out of his plastic though to compare exactly. Now those are waaaaaaaay cool! Enjoy! They are, I will, and thanks! HOORAY! I'm glad the wait was worth it, they're beautiful. Thank you, yes I think it was worth the wait. 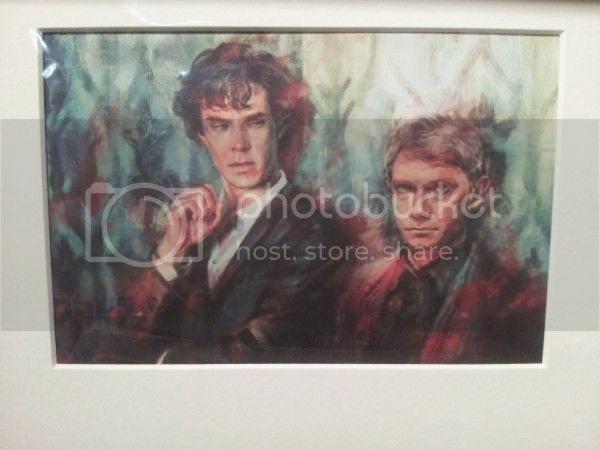 The level of detail on them is quite astonishing, clothes-wise as well as likeness, especially with BC. Thank you for your Christmas wishes (hey it's only 100 days till the next one now!). I knew they'd take a while, but hadn't realised quite HOW long they'd take. But they're here now, and all is good! You did yourself proud there, they're gorgeous. Thank you, aren't they just?! I'm that thrilled with them. Oh Wow!! They are fantastic! Well worth the wait even if it was frustrating for you. I thought I was quite patient, really; just kept checking the website to see when they were going to be posted. Finally got an email about three weeks ago asking me for clarification around my address (they had a PO Box for me but as the box was being sent via courier, they needed a street address) so I knew they wouldn't be too far away.